The 9th Annual Innovation in Retail Banking research report finds that the biggest threat to the financial services industry is keeping up with an increasingly demanding consumer, integrating new technologies, and using advanced data analytics to provide predictive recommendations. 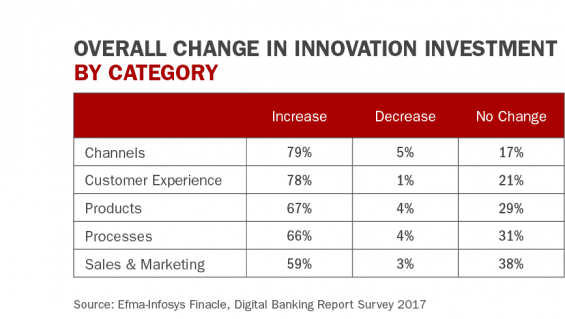 In Efma‘s 9th annual Innovation in Retail Banking report, written by the Digital Banking Report and sponsored by Infosys Finacle, it is clear that the innovation agenda has become even more intertwined with the digitalization agenda, where transforming back-office core processes and customer-facing experiences are brought together by application of data and advanced analytics. This year’s research found that the level of investment in both digitalization and innovation has increased in lockstep with each other as a result. Compared to prior years, it first appears that the focus on innovation and digitalization has decreased. As we dug deeper into the survey results, we found that this change was caused by a broader sample of organizations of all sizes being included in this year’s report. As opposed to including only larger banks and credit unions, our respondent base of over 250 financial institutions had a much more representative sampling of organizations worldwide than previous reports. Organizations continue to increase investment in innovation strategies across all functional areas. Digitizing products and services, the customer journey and security were the top three areas of focus for digital transformation efforts. The top innovation challenges were systems integration and legacy technology. Large tech companies, challenger banks and smaller fintech start-ups were considered to be the biggest threat to disruption. The greatest threat to banking products was expected to be in the areas of payments and mobile wallets. Technology investment is being made in ‘iterative’ technology as opposed to ‘disruptive’ technologies. Most financial institutions are still at an early stage of using analytics for descriptive or diagnostic customer support. Taking a ‘wait and see’ approach to innovation is not a viable option. Instead, banking management teams need to commit to investments that limit risk and allow an organization to take advantage of market opportunities. The proportion of banks increasing innovation investment each year increased from 2009 to 2016, with the first decline in this measure being evidenced last year (from 84% in 2015 to 78% in 2016). The percentage of firms increasing investment in innovation increased slightly to 79% in this year’s study. While the percentage of firms increasing investment in innovation remained relatively flat this year, it is interesting to note that the number is relatively the same across all geographic and sizes of organizations. As mentioned, there was a substantial increase in the number of smaller organizations included in this year’s study, yet the numbers remained consistent. We do see that more large organization are increasing investment than smaller firms. As was the case in 2016, the areas where investment in innovation increased the most was with channels and customer experience. 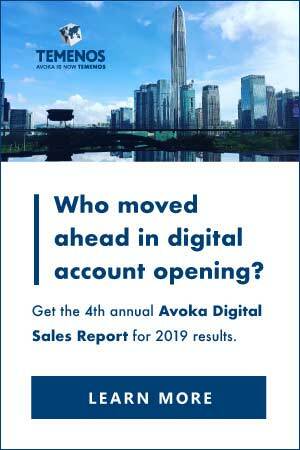 This is consistent with other research done by the Digital Banking Report such as the annual Retail Banking Trends and Predictions report. Compared to 2016, there was little change in the other categories. Read More: Does Your Bank Need an Innovation Lab? The priorities for banks in their digital transformation in 2016 included creating a customer-centric organization, enhancing channels to give an omnichannel digital experience, maximizing usage of mobile and social technologies, and enhancing or re-designing products and services for the digital age. The biggest barrier to digital transformation in 2016 was the legacy technology environment. The lack of a unified vision for digital and the lack of skills and experience were also important barriers for many banks. 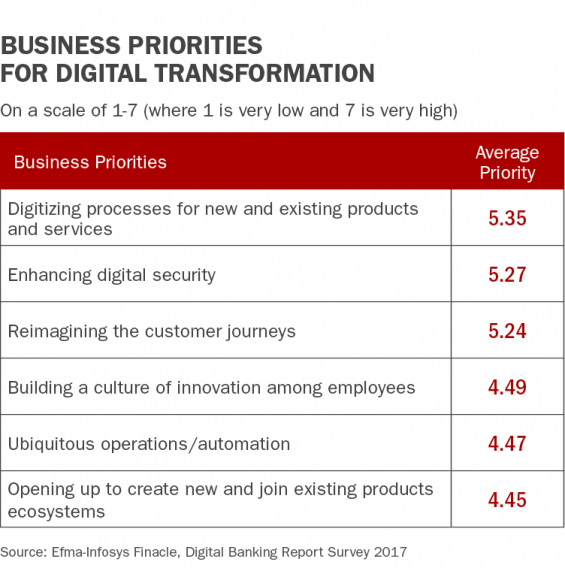 In 2017, there was a shift in many of the digital transformation priorities, with digitizing processes for products and services being ranked 5.35 on a 7 point scale. Reflecting the current cybersecurity environment, enhancing digital security was the second highest rated digital strategy, compared to being a mid-ranked strategy in 2016. Finally, improving the customer journey was ranked 5.24 on a 7 point scale in 2017, moving from the number one mentioned strategy in 2016. 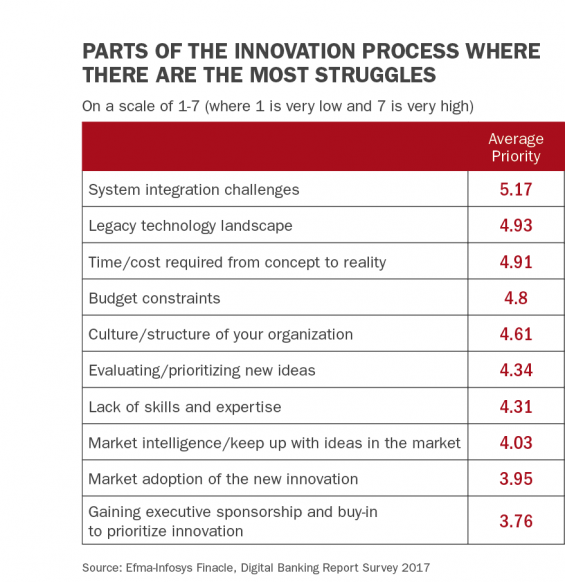 In most of the research conducted by the Digital Banking Report and Efma, organizations continue to struggle with legacy systems, technology and funding. The same was the case with this year’s survey around innovation. On a 7- point scale, systems integration (5.17), legacy technology (4.93) and the resources of time and cost (4.91) were the areas of biggest struggles. Somewhat surprisingly, the ability to get executive level sponsorship and support and the lack of expertise and talent were not greater challenges. We believe that talent will become an increasing challenge in the future. 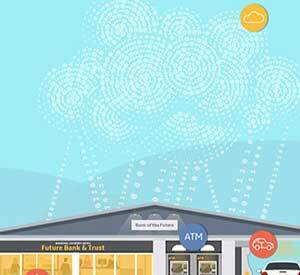 Over the past several years, digital technologies have changed the once staid banking industry. The collection and advanced analysis of data has changed the way customers are viewed, and the introduction of mobile devices has altered the way consumers access their bank. 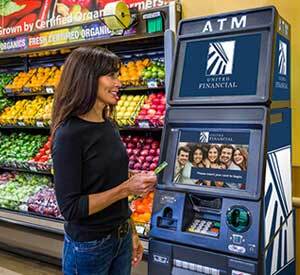 In short, digital transformation is on the front burner of all banks and credit unions. At a time when most organizations are still playing catch-up, a new wave of digital technology has the potential to change the way organizations deliver banking services even further. These new technologies include artificial intelligence (AI), the Internet of things (IoT), blockchain, open banking platforms with application program interfaces (APIs) and robotic process automation (RPA). As quickly as past technologies have become the norm, a new wave of emerging technologies will combine digital technologies and the power of data to set new standards. The prioritization and investment in each of these technologies will vary based on the business model and strategic goals of each organization. For instance, while larger organizations foresee investing in blockchain technology, smaller organizations do not see this as a major priority, impacting the overall industry numbers. 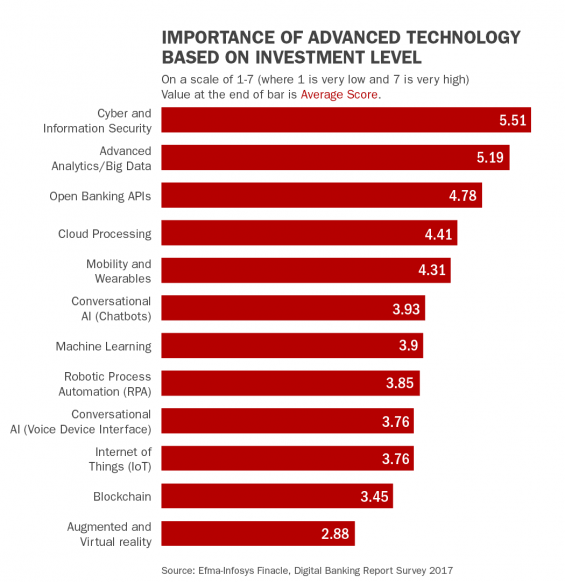 Most of the investment in advanced technology is dedicated to security (importance of 5.51 on a 7 point scale), data analytics (5.19) and open banking APIs (4.78), according to our research. These could be considered ‘iterative’ technologies compared to the more ‘disruptive’ technologies of augmented and virtual reality, robotics, the Internet of Things (IoT) and conversational interfaces. In our research, cloud technologies and wearables scored rather well from an importance perspective. In related research done by the Digital Banking Report, we have found that organizations are beginning to reduce their focus on specific devices (smartphone, wearables), instead taking a device agnostic perspective on digital development. As the volume of data has increased exponentially, the consequences of not leveraging insight has never been more pronounced. Ineffective marketing, dissatisfied customers, missed opportunities and reduced wallet share and loyalty are the costs of not communicating to each customer in a personalized manner. While traditional analytics provide a great “rear-view mirror” perspective of what has happened, advanced analytics provides a “GPS” perspective of opportunities ahead. Financial institutions that effectively leverage data and advanced analytics will be in a position to capitalize on newer technologies such as machine learning and automation. Those firms who fall behind will need to quickly overcome barriers that are preventing them from enjoying the benefits of advanced analytics or they will find themselves too far behind to catch up. 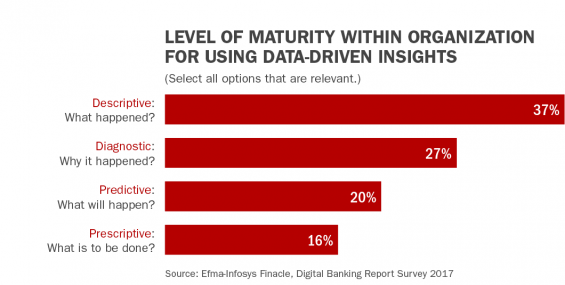 When we asked financial organizations about how advanced they were in applying data towards an improved customer journey and experience, there was a vast distribution of analytic maturity. Not surprisingly, the largest percentage of organizations (37%) believed they were only able to tell customers what had already happened. More advanced organizations (usually larger firms) could help consumers understand why something happened (27%), with one in five being able to assist customers in understanding what will happen in the future. Finally, 16% of financial institutions who responded were able to provide advisory capabilities around what the customer could do given the insight known. In order to reimagine banking in today’s increasingly competitive environment, there needs to be a focus on disruptive technologies and innovations, as opposed to simply an iterative focus. The winners in the future will be defined by those organizations that can leverage digital technologies to deliver a customer experience that goes beyond the ordinary. 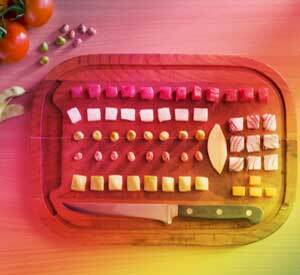 Taking a ‘wait and see’ approach to innovation is not a viable option. Instead, banking management teams need to commit to investments that limit risk and allow an organization to take advantage of market opportunities. 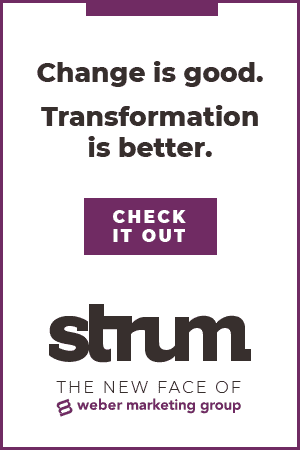 More than ever, the banking industry needs to manage for the long-term, through cycles, even as they adapt in the short term through continuous test-and-learn experimentation. 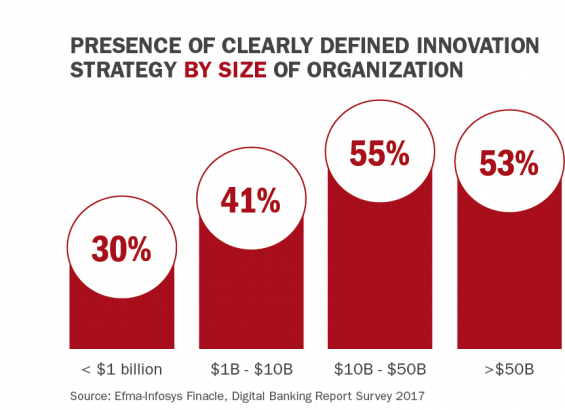 Financial institutions need to develop a rigorous approach to emerging technology and innovation — one that includes a formal framework of listening to those on the leading edge, learning the true impact of these technologies, sharing results from pilot projects, and quickly scaling by implementing them throughout the enterprise. In other words, being a leader in innovation and emerging technology is no longer a luxury only for the big players. 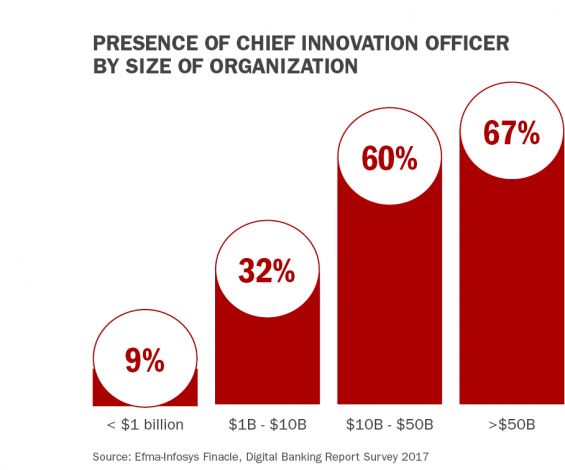 It is important for all financial organizations to make innovation and emerging technology a ‘core competency,’ with engagement throughout the organization (not just the very top). In addition, the focus of every implementation must include internal and external human experiences, as opposed to revenue, profit and cost savings. This article was originally published on October 23, 2017 . All content © 2019 by The Financial Brand and may not be reproduced by any means without permission.